When I read stories such as I have. Of the one on one , no mistake, it's really God talking. The rises and falls of the chosen people, I cringe. I could not imagine being worthy of hearing God speak directly to me. When God told Joshua what to do to defeat his enemy it seemed impossible . God first told Joshua to enlist the service of a protitute named Rahab to spy on the enemy troops. Then God said take your soldiers and 7 priest and run around the city walls once each day sounding the horns and carrying the arch of the covenant. On the seventh day have the priest sound their horn while the people shout at the top of their lungs. This action caused the walls of Jericho to crumble. They defeated their enemy . 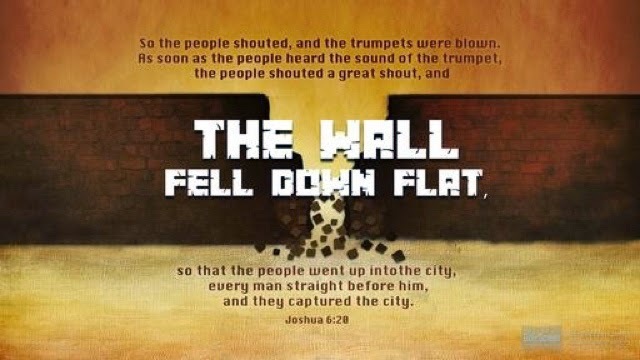 Though we walk through life knowing and feeling " the walls of Jerihco " we do have God and through Jesus we can have the walls come tumbling down.